Pour the warm water into a bowl, add the yeast and sugar. Let it rest for 10 to 15 minutes, until frothy. Combine the flour, corn flour and salt. Form a well in the centre and pour in the yeast mixture. Add the yoghurt. Knead the dough until it comes together. It should be elastic and slightly sticky. Form a ball, place it in a lightly oiled bowl and cover with a clean cloth. Let the dough rise in a warm place for 1 hour, until it has doubled in size. Cut the dough into 2 equal halves and spread out by hand on a floured surface. Turn on the barbecue, place the pizza stone on the grill and heat for 10 minutes. When it is hot, place the pizzas on top, close the barbeque and cook 2 to 3 minutes, or until nicely grilled on the base. Brown the chicken breast fillets on the barbeque and continue to cook on low heat. Set aside. With the help of a spatula, flip the pizzas over. Brush with olive oil. 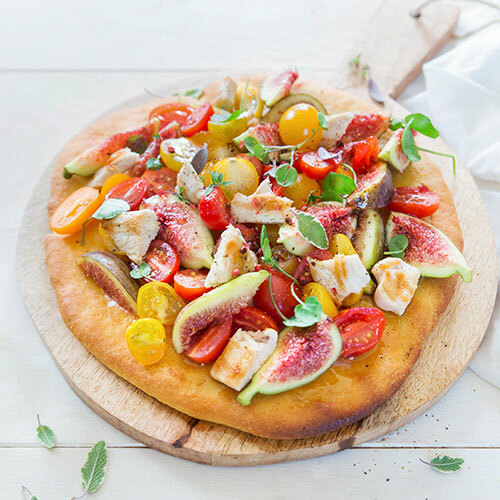 Spread the fresh cheese on pizza, add the sliced chicken fillets and quartered figs. Continue to cook for 2 minutes. Scatter cherry tomatoes, parmesan cheese and rocket lettuce over pizza. Season with salt and pepper. Serve immediately.